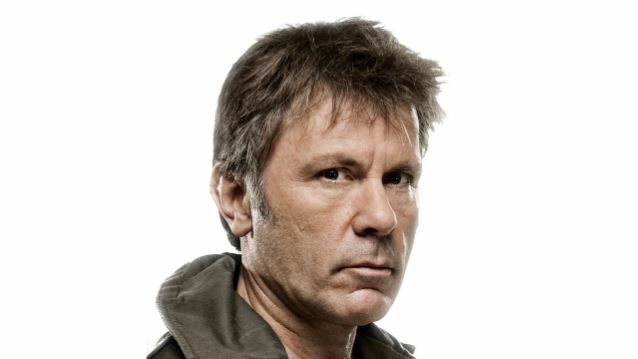 IRON MAIDEN singer Bruce Dickinson has weighed in on the strange situation regarding AC/DC and singer Brian Johnson. The legendary Australian rock band postponed the last ten dates of its recent North American tour after doctors told Johnson he faced "total hearing loss." AC/DC has since announced that it will use GUNS N' ROSES singer Axl Rose as a "guest vocalist" when it resumes its tour next month, with Johnson apparently not returning to the band at all. Speaking to Australia's Adelaide Now, Dickinson stated about the prospect of an Axl Rose-fronted AC/DC: "It's an odd situation. I hope Brian can get some respite for whatever his medical issue is. He's a lovely guy. There's just Angus [Young, guitar] in AC/DC now as far as original members. I hope Angus ends up holding up the amazing reputation and the name of AC/DC. " According to a Billboard.com source, Rose initially met with AC/DC members in Miami and Atlanta back in March. It was then that the decision was made to have Rose join AC/DC on tour. There was also talk of having other singers alternate with Rose, including ex-SKID ROW frontman Sebastian Bach and Nic Cester of the Australian band JET. Fan reaction to Rose replacing Johnson — even temporarily — has been largely negative. The fan site AC/DC Italia announced it was shutting down in protest, while AC/DC biographer Jesse Fink called it "the worst decision AC/DC has ever made. Fans are pretty disgusted... AC/DC is all about the money now." AC/DC guitarist Angus Young made a guest appearance with GUNS N' ROSES at the Coachella festival in California earlier in the month, to tie in with the official confirmation of Rose's involvement.